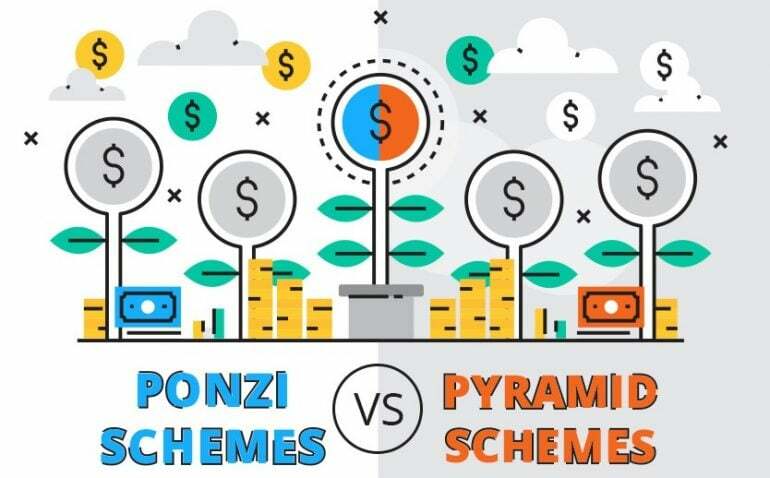 Ponzi Schemes vs Pyramid Schemes: What Is The Difference? Pyramid and ponzi schemes are similar in many ways. They both involve an investment in phantom items under a stealthy ‘get-rich-quick’ façade and both are hugely unethical, giving them and the people perpetrating them a very bad name. The terms are regularly used interchangeably by people who don’t realize that there are key differences between the two. Pyramid schemes have a terrible reputation, although there is a tiny level of substance to them in that they often have at least a basic product on offer, while investors can earn new returns if they are successful in recruiting several others to invest in the scheme or in selling the product on offer. Before anyone invests in a pyramid scheme, they have a good idea what they are letting themselves in for, i.e. getting money back by convincing others to invest. As this is the only way in which people can see a return on their investment, there is a strong incentive for them to actively seek out new investors. The idea of a pyramid scheme is not an honorable one but nor is it inherently illegal. Some companies could theoretically use a legitimate version of a pyramid to help with the firm’s legal validity. Still, the founders of a pyramid scheme could end up in huge trouble if they are caught. The ‘Give and Take’ scheme in the UK was one such example of how involvement in such a project can irreparably damage a person’s reputation. It was the brainchild of eight women whose names had been bulletproof until the scam was uncovered. It involved a fee of £3,000 to invest in the scheme and anyone who came on board had to recruit at least eight people to receive a cash return of £23,000. Pyramid schemes are dodgy, but they seem positively glowing when compared with Ponzi schemes. These are based on a fraudulent investment idea and essentially involve the transferring of funds from one party to another. An investor is recruited by someone who then takes their money to pay a previous investor, so there is no real benefit from the scheme. The shadiness of it all requires every activity to be kept under close wraps, as it involves the creation of a company that doesn’t do any business. To put it another way, it’s an out-and-out lie. Unlike a pyramid scheme where investors are required to actively pursue other people to get involved in the project, Ponzi investors are sitting ducks after they have put they money into the project. They simply invest and wait for returns that will never come. The only real winner is the creator of the Ponzi scheme who pockets a fee for managing the whole dodgy enterprise. Ponzi schemes are totally illegal and there is no attempt made at disguising its iniquitous nature. Indeed, the entire scheme will collapse instantly if it is discovered by someone from the outside, which is why anyone involved in Ponzis will remain incredibly tight-lipped about it – that, and also because Ponzi participation is not something of which too many people would be proud. They tend to survive for longer than pyramid schemes, though, as there is no requirement to get new investors on board. The trade-off is that the longer a Ponzi scheme survives, the more money an investor will lose. If you get in on such a project at an early stage, you could end up losing millions of dollars, and that’s not a dramatic exaggeration. This infographic from Easy Life Cover compares Ponzi and pyramid schemes under several main criteria, although the key takeaway is the same for both. You’re playing with fire if you get involved in such projects and you could get badly burned at any time with no warning. If your involvement in a scheme relies on you to sign others up to recoup your investment, walk away from it immediately. Also, if a scheme offers a worthless product or service, it is probably built on sand. Basically, if a money-making scheme sounds too good to be true…it probably is.